↑ Kettmann, Steve (April 18, 2000). 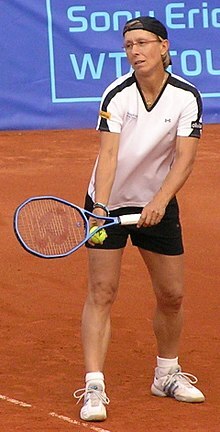 "Martina Navratilova". Salon. Retrieved September 28, 2014. ↑ Adams, Susan B. (September 3, 1984). "Navratilova's Not-So-Silent Partner Is Tough Coach Mike Estep". People. Retrieved September 28, 2014. ↑ Bricker, Charles (August 21, 1994). "Martina Done With U.s. Open, But Not With N.y.". The Sun-Sentinel. Retrieved September 23, 2014. ↑ Lincicome, Bernie (July 8, 1990). "A Natural Ninth For Navratilova". The Chicago Tribune. Retrieved September 21, 2014.